I see these tiles in my dreams. I’ll admit it. I’m addicted to Hive. When we went to PAX Aus recently, we packed a bunch of small games to have handy while waiting in line or passing time between panels. I specifically didn’t bring Hive with us because I realize I suggest it so often. Near the end of the first afternoon, a friend and I were wandering through the board games library looking for something to play until Josh got out of work. The collection was pretty picked over by then. 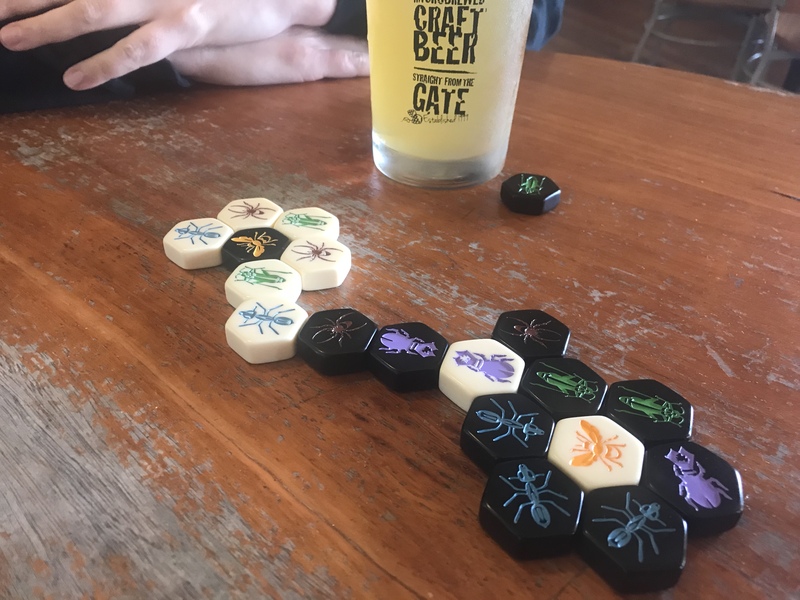 During Hive, you and your opponent take turns adding or moving insect tiles to create a hive structure. 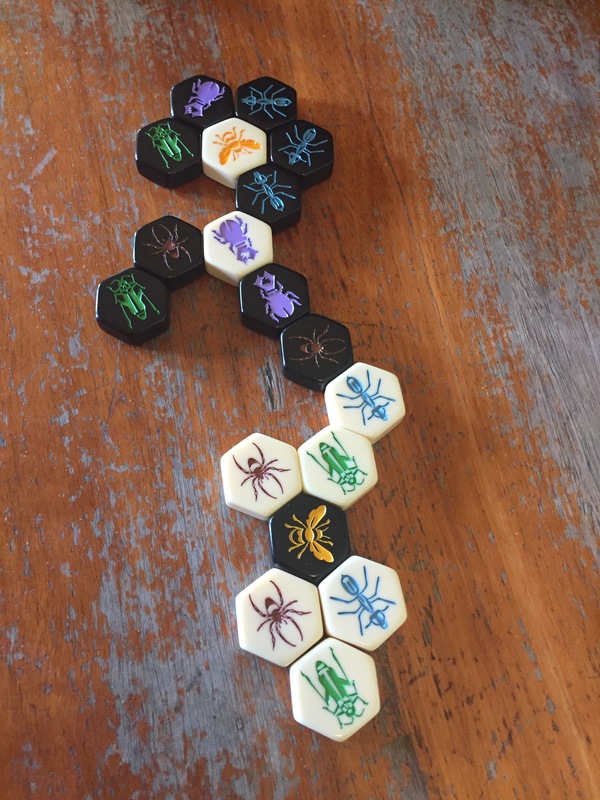 The object of the game is to surround your opponent’s queen with your insects, though you cannot do so by placing your tiles directly next to her. An insect can only join the hive next to other friendly insects, no sides touching opponents. Once the tile is placed, you can use the insect’s unique movements on a later turn. The insect movements are easy to remember because they’re fairly appropriate to each bug. (I won’t go so far as to say they’re realistic though. Pretty sure these insects would not be friends IRL.) Ants have unlimited movement along the edges of the hive, for example. Spiders also move along the edges, but must move exactly three spaces. Grasshoppers can hop over other insects, taking a straight line across to the opposite side of the hive. Beetles only move one space, but can move up on top of the hive, covering other insects and immobilizing them. (As a bonus, even if your beetle covers an opponent’s piece, you can lay a new tile adjacent to it.) The queen can move, but just one space at a time. At the start of the game, players take turns laying tiles. They can place insects in any order they like, but must always add to the growing hive. Each side must also place the queen within the first four moves. Once your queen is down, you can move one of your hive tiles rather than placing a new one. For tiles like the spider, ant, and queen which can only move along the edges, you must be able to freely slide the tile on the table without breaking the hive in order to move it. Grasshoppers and beetles can’t be blocked in, however. As long as they are not covered by another piece and the hive is still otherwise contiguous, they can move as usual. This is where the game gets really interesting. I have to admit that when Josh and I first read through the instructions, I was a bit underwhelmed. Okay, move the bugs, whatever. But after we played three or four rounds, we realized… this is a surprisingly deep game. This is not just about swarming your opponent’s queen. This is about controlling your opponent’s tiles with your own. It was a very fun game to learn together, uncovering the layers of strategy at the same time. We don’t have the pillbug yet, in part because we still need to track down the pocket-sized version. We could double up and buy the full-sized version to get it into our collection more quickly. Given how much we love the game, it’s a definite possibility. 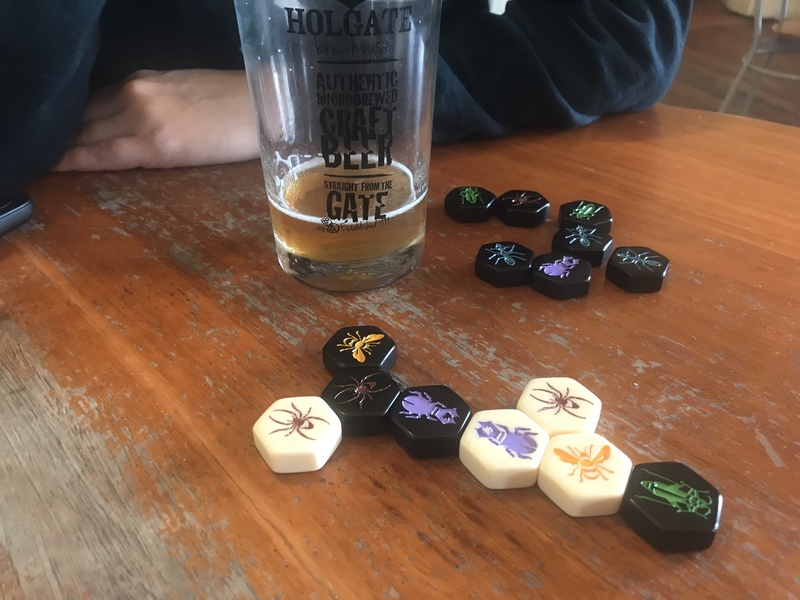 Hive is a perfect pub game. Not only is it completely pub-proof right out of the box, it’s perfectly portable (comes with it’s own little draw-string bag!) and plays on the smallest of tables. You could play this sitting side by side at the bar if your barkeep didn’t mind. Josh and I have even played Hive on a little fold-out tray table during a flight. In addition to being impervious to spills and other bar-related catastrophes, the tiles are very pretty. I like the colors, but if a monochromatic set is more to your taste, there is a black and white set available instead. Hive is not difficult to learn, but there are certainly some nuances. When I teach people to play, I usually point these out during the first couple games. There are ways to play defensively that happen in parts of the hive many tiles away from the queens, for example. There’s nothing worse than getting smashed over and over when you’re learning a game. A quick post-mortem is valuable, too. Josh and I still do this after we play, talking about things we noticed or pondered during the end game. Although I wouldn’t say that Hive is a mean game on the competitive spectrum, it is a bit more combative than something like Onitama. 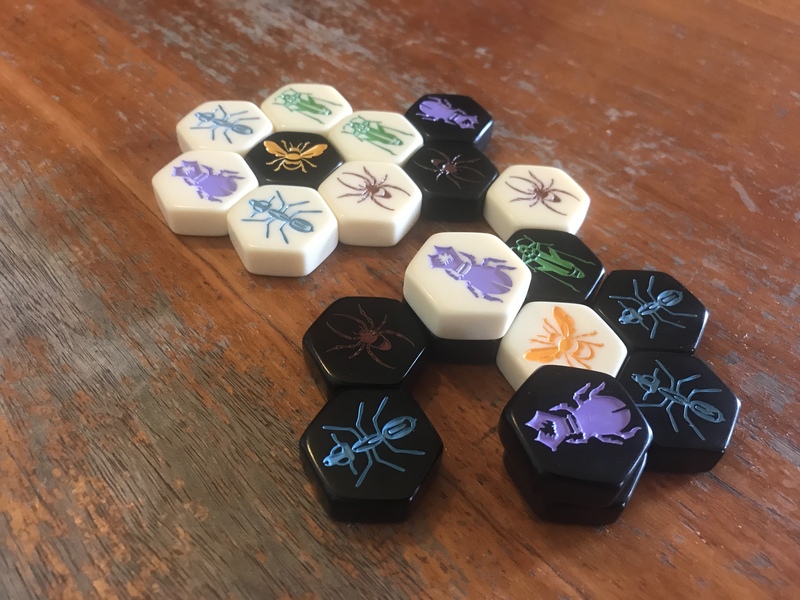 In Hive, your tiles are physically pinning or blocking the ones your opponent wants to move. The games are very quick, however, and there is literally no set-up in between. Just bust up the old hive, separate the tiles into colors, and build again.